Sailing into Valletta, Malta, is akin to stepping into the pages of a J.R.R. Tolkien fantasy; once you are in the protected harbor, it feels as though modern civilization has disappeared. Oh, you can see a car or two driving on the winding streets amid the limestone battlements, crenellated castles and hillside structures, but they seem terribly out of place and unexpected. Never mind that Malta, which owns 7,000 years of intriguing history, is fully modernized and contemporary. What you see when entering Valletta Harbor are the formidable defensive stone battlements of forts pockmarked by war guarding the strategic waterway. Cream-colored buildings and ancient church steeples grow out of the twisting streets and hillsides. In the bay and channels, Malta's colorful luzzo boats, fishing craft resembling an elf's shoe, ply the waters in the wake of modern giant cruise ships and tankers. Valletta was built by the Knights of St. John as a place to take care of wounded soldiers and pilgrims during the Crusades in the 16th century. Its unique landscape and ancient buildings have appeared in films such as "Troy," "Gladiator," "Captain Phillips" and "World War Z." This tiny Mediterranean country is part of an archipelago of five islands, only three of which are inhabited. Cruise ships visit the island of Malta and the port of Valletta (designed by a colleague of Michelangelo). Malta has been inhabited since 5000 B.C. and was colonized by the Phoenicians in 1000 B.C. Then, the islands went in turn to the Greeks, Carthaginians, Romans, Byzantines, Arabs, Normans and the Spanish, who handed them over to the Knights of the Order of St. John in a "perpetual lease" in 1533; this lasted until Napoleon seized control in 1798. The Maltese did not like the French, however, and rebelled by seeking aid from Great Britain; Malta became a British protectorate in 1800 and a part of the British Empire in 1814. Later, it shook off the British, as well, and was granted independence in 1964. Since 1974, Malta is a republic under the British Commonwealth. The influence of all of these cultures is evident in Malta, with the Roman period seemingly taking precedence. Cruise ships dock in Valletta, about a half-mile below the main shopping street of the city at the Pinto Wharf. The Valletta Waterfront pier area with its 19 historic 250-year-old warehouses makes this one of the nicest cruise ports in Europe. Filled with shops, restaurants and bars, the complex is also a destination for residents. On any given day, there might be a festival or musical performances like a jazz band conclave or classical recital. You can take your time reboarding while you relax at the Hard Rock Bar Malta, or pick up last-minute purchases at Mediterranean Ceramics, the Agenda Bookshop or a branch of Mdina Glass, one of Malta's top glass makers. There is an ATM in the center, as well. While crime rates are low, visitors should exercise caution in crowds, at beaches and at night. Also, if you are considering renting a car, keep in mind that the Maltese drive on the left-hand side of the road. In addition, if your ship docks in Malta on a Sunday, many stores, restaurants and attractions will be closed -- some all day and some until noon. By Taxi or Horse-Drawn Carriage: These two methods are expensive, considering the short distance: about 10 euros to go up the hill in a taxi and about 50 euros to go on a horse and carriage ride (35 euros if you haggle a bit). On Foot: Walking into town is good recreation for reasonably fit travelers but can be very difficult for anyone who is even minimally mobility-impaired, as it is a steep climb, and summer temperatures can be steamy. Additionally, it's a quarter-mile trek just to the port exit gate, and there are no benches along the way for resting. By Lift: Perhaps the best way to get to the old city is via the Upper Barrakka lift (elevator) linking the harbor with the Upper city center, and it's a bargain at one euro for a roundtrip. The two lifts each carry up to 21 passengers at a time, which means they get a little backed up when cruise ship passengers are first allowed down the gangway. It's open daily from 7 a.m. to 11 p.m., and it's best if you have a one euro coin ready, although there frequently is someone standing by to make change. By Bus or Ferry: There are reasonably priced public buses that can take you to various spots on the island, including the ancient walled city of Mdina. There are also ferries that can take you to Gozo and Comino. The bus terminal area is just outside the upper town. (Ask a local or someone at the tourist information center if you can't find it.) Pay careful attention to return timetables so you don't miss your ship's departure time. Currency is the euro. Visit www.xe.com or www.oanda.com for conversion rates. U.S. dollars are not accepted in many establishments, but major credit cards are good in most shops and restaurants. Most hotels and major stores will accept payment in dollars and pounds, although conversion charges may be applied. Several banks in Malta are open Monday through Saturday, and you'll find several well-placed ATMs on the main shopping road and in the Valletta Waterfront complex at the cruise ship terminal. Both Maltese and English are the official languages of Malta, and English is widely spoken. 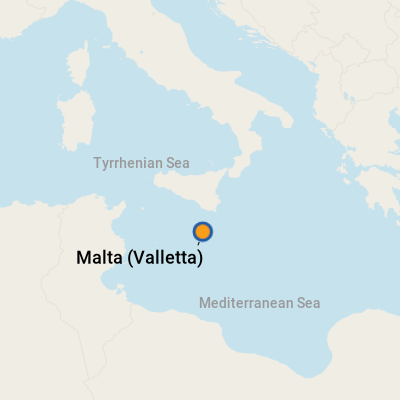 Maltese traces its roots to Lebanese and includes Arabic and European influences. At the Port of Valletta, a picturesque string of cafes line the dock at Valletta's Grand Harbor; these range from the Hard Rock Bar Malta (which serves sandwiches) to Chinese and Italian. Lunching in Valletta can be casual and charming by sitting alfresco at one of the many outdoor cafes, or casual and cheap by purchasing Maltese pastizzi (flaky pastries filled with meats and peas sold at little kiosks). Xara Palace Hotel: A trip to Mdina wouldn't be complete without lunching in the grand restaurant at the 17th-century palazzo, now the Xara Palace Hotel. You can choose from its fine-dining restaurant or its trattoria for a more relaxed (and less expensive) experience -- perfect for families. (Misrah Il-Kunsil; +356 2145 0560 ; open for lunch and dinner ). Gozo glass crafts are made on the island of Gozo but sold in shops throughout Malta, these silky, swirly and opaque glass creations use centuries of artistic skills passed from one artisan to another. You can purchase small items like perfume bottles or larger blown-glass sculptures. Handcrafted jewelry made of fine silver filigree is a Maltese tradition that dates to the time of the Knights and has been passed down through generations of goldsmiths and jewelers.